Khyber Pakhtunkhwa Information Minister Shaukat Yousafzai has rejected the propaganda on social media regarding wrong-side door of buses imported for Bus Rapid Transit (BRT). In a statement issued on Saturday, the minister clarified that the 12-meter long buses had passenger doors on both sides. In a statement, Shaukat Yousafzai said BRT Peshawar buses were state-of-the-art in every aspect. Doors have been installed on both of its sides, he added. “False and baseless propaganda is being spread on social media regarding the buses. The buses would be run on feeder routes of Bara Road, Kohat Road and Charsadda Road apart from BRT system routes,” he said. Last week, a woman was crushed to death under BRT bus in the provincial capital. According to details, the BRT bus was being run on a trial basis near Phase III Chowk in Hayatabad area of Peshawar during which a woman climbed down the railing and came on the track. Yousafzai said these buses would be run on BRT routes as well as on its associated feeder routes including Bara Road, Kohat Road and Charsadda Road in Peshawar. 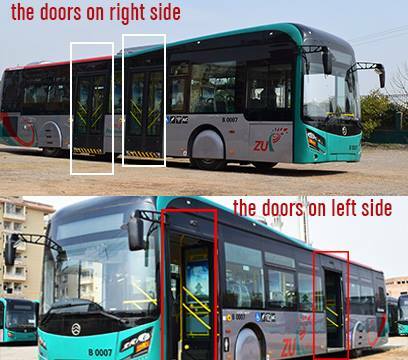 Yousafzai said during rush hours on feeder routes, the left-side doors of the buses would be used while on stations’ platforms the right side doors would be utilized. Earlier this week, due to the frequent changes of deadlines for the completion of Peshawar’s Bus Rapid Transit (BRT) project, the Khyber Pakhtunkhwa chief minister ordered an inquiry into the project. Chief Minister Mahmood Khan was supposed to inaugurate the project on March 23, but work on the project has not been completed, and he was told that the inauguration was not possible. Khyber Pakhtunkhwa inspection team released a report that pointed out faults in the BRT project.